Ah, Valentine’s Day. A time when couples the world over prepare incredible displays of affection for one another. In North America, that means flowers, a continuation of the chocolate coma that starts around Christmas, and of course, the reason for the season: gifts to express just how much your loved one means to you. We here at Nerd Much like presents as much as the next person, and this year we figured we’d help y’all out. Nerds need love too, right? Here are 21 of the Nerdiest Valentine’s Day Gifts that are sure to give you a +10 to your Charisma score. One cannot look up Star Wars quotes without finding this in under a minute — and that’s giving it some time. This iconic dialogue was spoken between Princess Leia and Han Solo, and has since been launched into quote history. Now, you can be a part of the romance (or nerd up a romance of your own) with this matching pillowcase set. 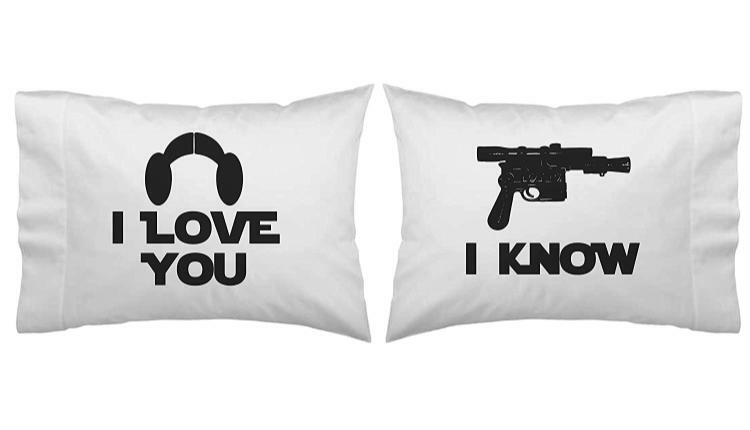 Made from 300 thread count 100% Egyptian cotton, these printed pillowcases feature Leia’s iconic hair on one, and Han’s blaster on the other. Each measures an approximate 21.5″ x 30″ and fit most standard-sized pillows. 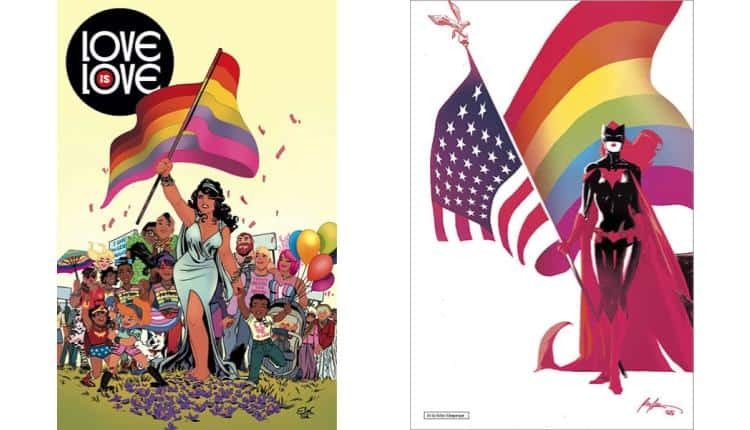 This anthology is the product of over 300 comic book artists and writers from across the industry who came together in the wake of the 2016 Pulse Nightclub massacre. These artists and writers wanted to spread the message that Love is Love, and filled this anthology with over 100 graphic shorts to show just that. Curated by Marc Andreyko, this 144 page anthology features several familiar characters, including Wonder Woman, Batman, Archie and the gang, and more. Show your support and love this Valentine’s Day with this gift. All proceeds from purchasing this book go toward Equality Florida, which is “a 501(c)4 organization dedicated to securing justice and equality for Florida’s lesbian, gay, bisexual and transgender community. Romeo and Juliet has nothing on Morticia and Gomez, in our most humble opinion. Send the wild creature in your sweetheart’s ribcage a-howling with this throwback to a timeless goth classic. Waltz about to these 13 songs from the original 1960’s television series, based on the cartoons by Charles Addams. 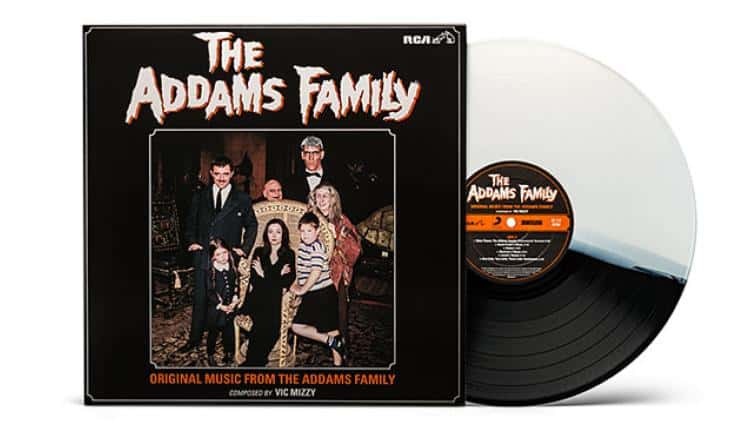 All remasted onto this two-toned vinyl LP with fantastic technicolor shots from the show, this is the perfect gift for that special someone whose name silences your demons. 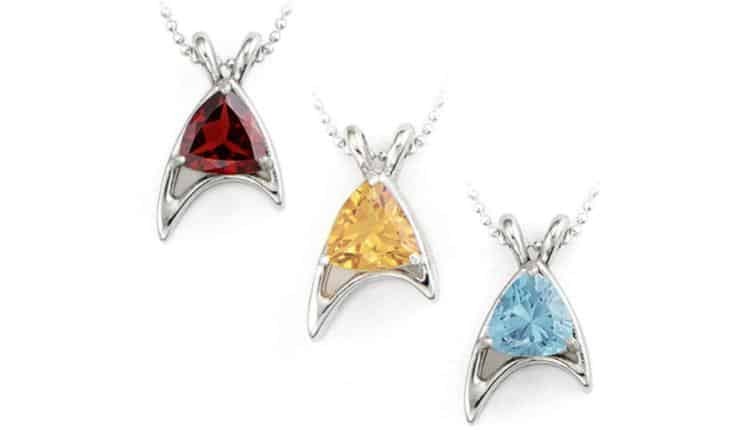 Send your Trekkie to the moon (or further, but we really want you to get them back) with one of these absolutely gorgeous handmade Star Trek trillion necklaces. These necklaces are made from nickel-free sterling silver so you needn’t worry about any adverse reactions to skin contact. Set with 7mm trillion-cut semi-precious gemstones, you can customize your sweetie’s preferred division’s colour. The necklace measures an approximate 0.67” x 0.39” (or, for more accuracy, 17mm x 10mm). The sterling silver bead chain measures an approximate 20” long, and closes with a spring-ring clasp. The face of the gold watch features the intricate Gate of Time from Skyward Sword, while the silver watch’s face depicts Link from Breath of the Wild determinedly drawing his bow. The face-cover is stamped with the now iconic soaring Triforce with an intricate filigree, and the back has another Triforce set at the center. 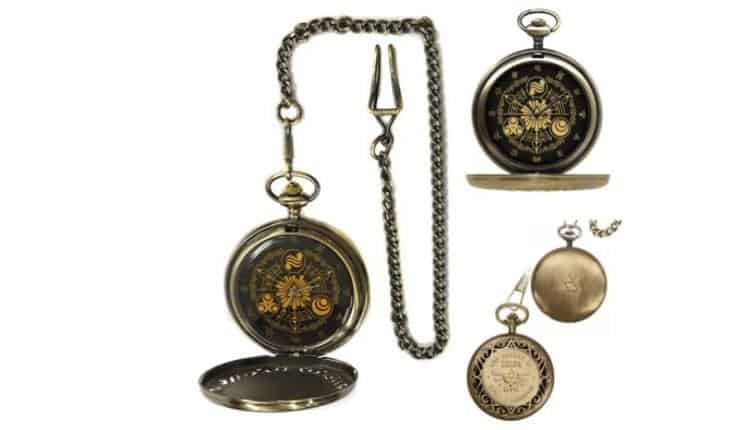 The watch itself measures an approximate 2.2” diameter, with a hook-ended chain that measures approximately 6.5”. Press the button at the top to pop the cover from the face, and time will never be your enemy again. **Yes, we know that both watches say Breath of the Wild, even though the gold one is really Skyward Sword. If you can’t do something smart, do something right. And the right thing to do is present your lover with this beautiful citrine and sterling silver Serenity necklace. This little beauty will surprise you. She may only be 0.6″ long x 0.4″ wide x 0.2″ thick, but that citrine gemstone at her back sparkles like nothing else in all the ‘Verse. Strung onto a shiny 20” sterling silver chain, this necklace is safe for those with metal allergies. What’s more, this here is bonafide Firefly merchandise, so says the little tags on the spring-ring closure, and on the card of authenticity what comes with it. 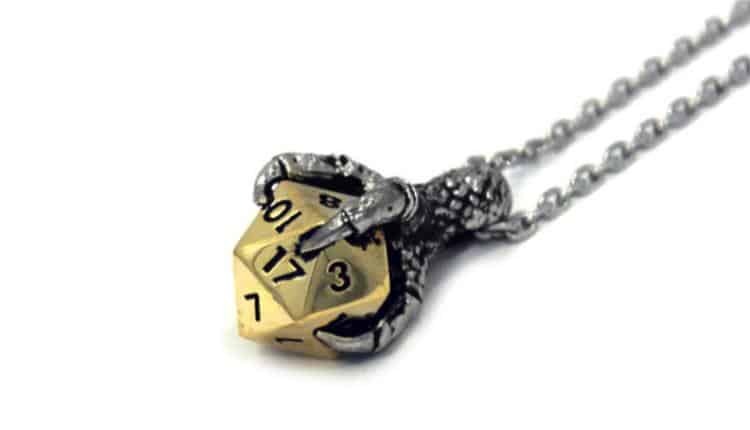 Present your beloved with the ultimate prize: the clawed hand of Tiamat, Queen of Chaos and Nemesis of the Gods, clutching a miniature gold D20. This sterling silver pendant is the perfect gift for the Dungeons & Dragons nerd in your life, especially if they just started (or finished… Or were finished by) Hoard of the Dragon Queen or the Rise of Tiamat. This 1” pendant is strung onto a 24” chain, both of which are 316 grade surgical stainless steel, and meet the guidelines set forth in EU Nickel Directive 94/27/EC. Unless your metal allergy is very severe, it’s completely safe. (Unlike a certain chromatic dragon goddess). Now, finally, you can answer the age old question. The one scholars have been debating over for millennia: “who’s a good dog?” — Well, this corgi is pretty high on the list. This has been scientifically proven, because we only want the best for you. 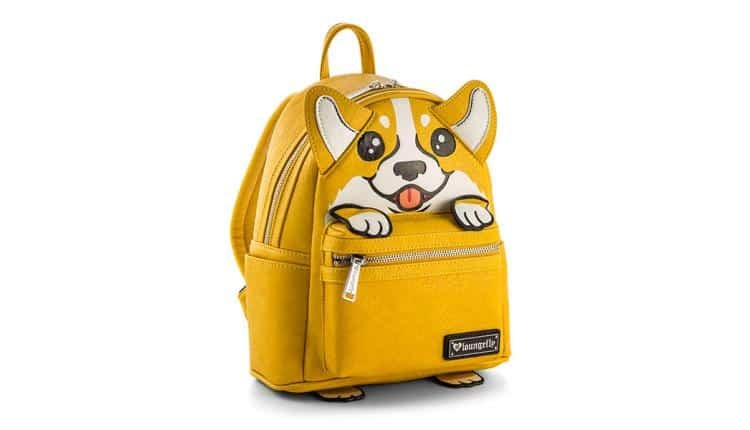 This absolutely lovable appliqué bag is made with yellow faux leather, and features a corgi face, ears, paws, and tail. I repeat: IT HAS A TAIL, PEOPLE. All in all, this bag is perfect for the dog lover in your life, (or for our amazing boss…?) The bag has two zippered pouches, a pouch on either side, and adjustable straps. At 9” x 10” x 4.5”, this little bag is perfect for your day out on the town, or out on a date to your sweetie’s favourite restaurant. 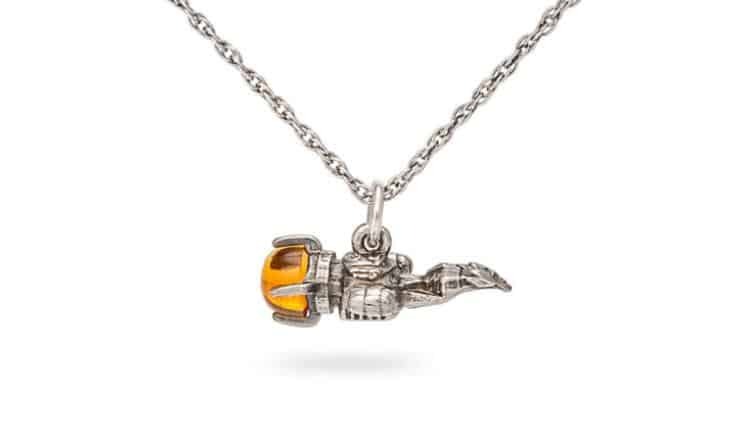 Give your lover an out of this world gift for Valentine’s Day this year. If they’re interested in the cosmos, then this necklace is sure to make their eyes light up like the night sky. 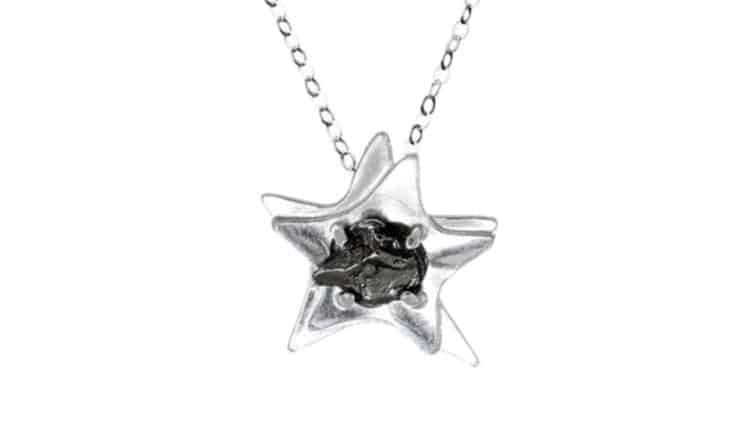 This sterling silver star pendant contains a fragment from the Campo del Cielo meteorite, which some authorities believe to have originally touched Earthen soil 4000 – 5000 years ago. The pendant itself measures ¾” x ¾”, and is suspended on a 18” sterling silver chain. Even if your honey isn’t that into astronomy, I don’t think they could argue that having a fragment of meteorite around their neck isn’t the coolest gift they’ve ever gotten. 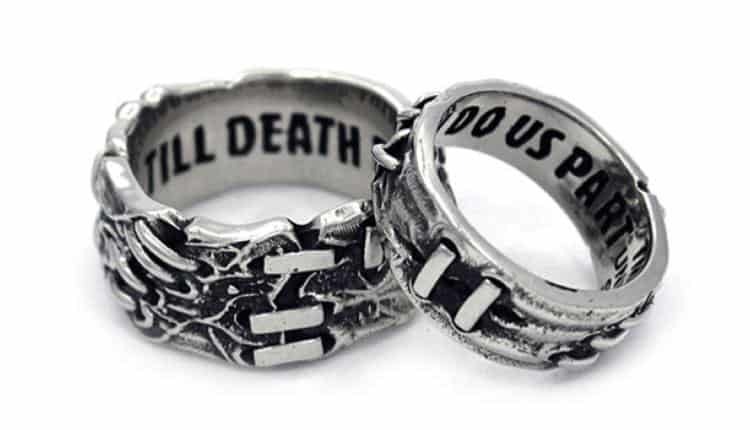 Give the phrase “till death do us part” a whole new meaning with these morbidly matrimonial rings. If you and your partner aren’t the type for the bland, boring old solid gold bands, then how about something a little more… visceral? Available in female sizes 6 and 7, and male sizes 9 – 12, these rings are made from 316 grade surgical stainless steel, which means that wearers with metal allergies won’t need to go to the hospital to get these stitches out. These rings feature stitches and staples along the exterior of the bands, and the phrase “till death do us part” is engraved on the interior. Pop the question with a ring like this to your favourite ghoul, and you’ll be looking for side-by-side cemetery plots in no time. Who doesn’t love kittens? Or explosions, for that matter? Now you can spice up your next game night with these two hilarious games from The Oatmeal. 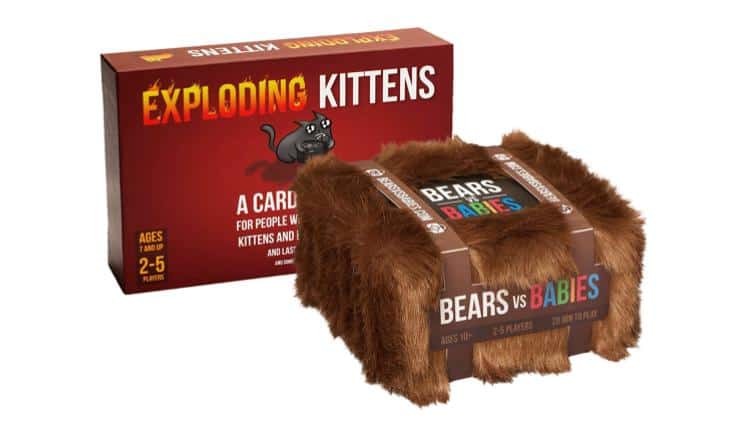 Sit down with your sweetie and choose to play either Exploding Kittens (the family friendly version) or Bears vs. Babies and let the fun begin! With an overall total of 163 cards between the two games, you’re sure to get round after round of ridiculous fun. Exploding Kittens we’re pretty sure everybody knows. It’s one of the most strongly backed Kickstarter campaigns ever, and it’s hours of entertainment (and explosions). Be the last to explode by diffusing, switching, and seeing the future in this card game. Available for 2-4 players, ages 7+. Bears vs. Babies is a monster-building card game, and comes in a fantastically furry box. This game is for ages 10+, between 2 – 5 players. Put on your biggest strategy cap and outbuild the babies and other players to win. There’s a lot of sources for the origins of the heart shape that’s so popular around Valentine’s Day: a seed pod, the shape of a woman bending over, and so on. 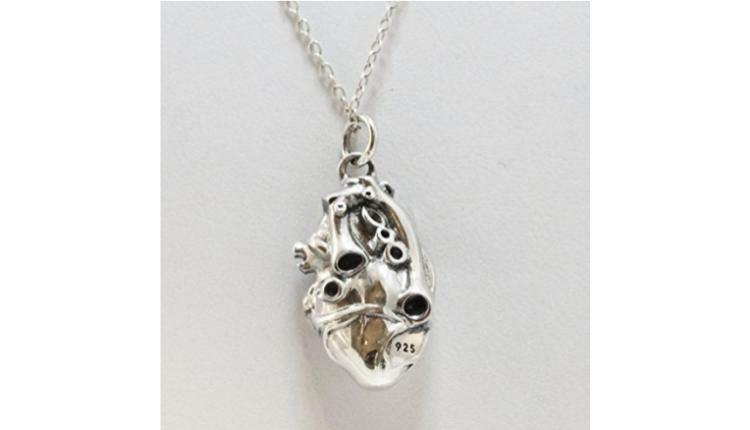 If your significant other is one for accuracy (or into anatomy) then this 3D anatomical heart pendant is sure to win them over. This sterling silver pendant measures 7/8″ x 9/16″, and hangs from an 18” chain. Incredible detail gives the pendant anatomical accuracy on all sides, making it the perfect gift for the one that gets your blood pumping. Do you have a lover who looks for just the right light to frame life? Who’s a whiz with a camera, and makes every snapshot of your lives together seem that much more magical? Recognise their passion for photography this Valentine’s Day by gifting them this realistic camera lens thermos. This thermos replicates a Nikon AF-S 24-70mm f/2.8G ED camera lens on a 1:1 ratio. 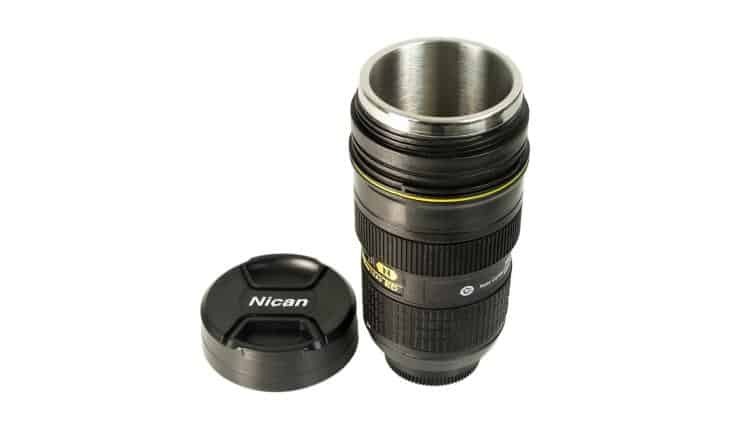 Although it looks alarmingly like a 2.9” x 7” Nikon lens on the outside, inside it’s lined with heat-retentive stainless steel that can hold 14.5oz of your love’s favourite beverage, hot or cold. If you’ve got a Legend of Zelda fan on your hands, then they’re absolutely going to love this handcrafted light by Plasmatorium. 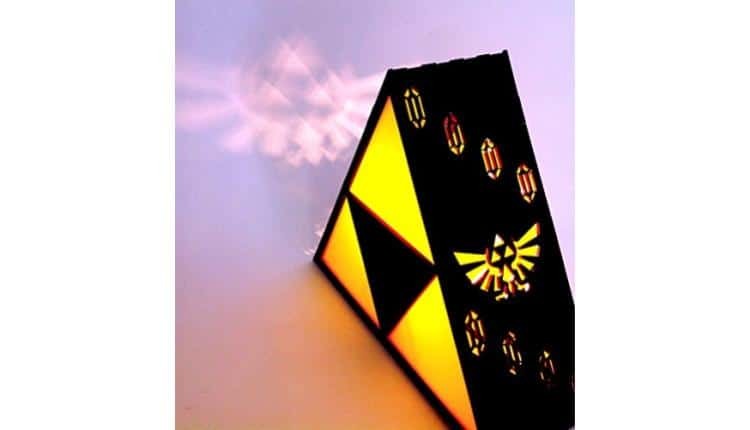 Measuring 9” on all sides, this acrylic lamp features the completed Triforce on its face, and the the Hyrule royal crest along the sides, along with some rupees that, when turned on, will throw the image into relief on the walls. The lamp fits an E12 base bulb (like one you put in a chandelier) and comes rigged with a US standard 110V plug. Use this lamp for ambiance in your nerd den or as a nightlight in your room, or just to make your friends jealous when they next come over. It’s the perfect addition to any Zelda lover’s collection. Everybody knows that a good campaign begins and ends in a tavern. Now, you and your favourite person(s) can find out what really happens after the last dragon is slain and the conquering heroes return home for some well-deserved feasting. 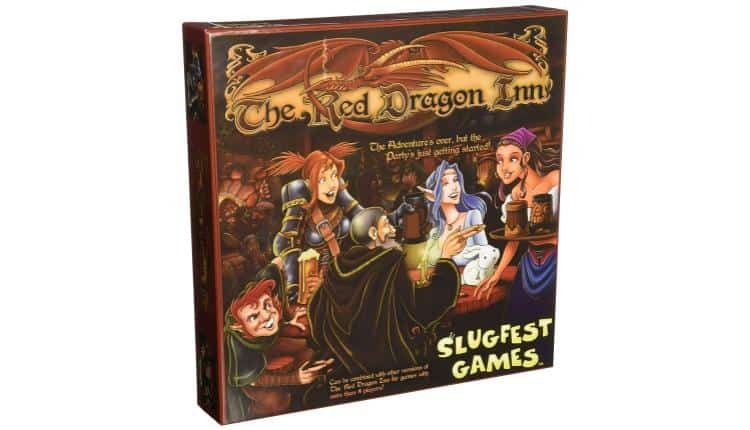 The Red Dragon Inn is a 2-4 player tabletop game, with 4 unique, 40-card player decks. Drink, feast, and gamble in celebration of successful questing! The goal of the game is to be the last hero standing with your wits and gold in-tact. If you black out or lose all your gold, then you’re sleeping it off in the stables! Check out more great new board games for 2018 here. 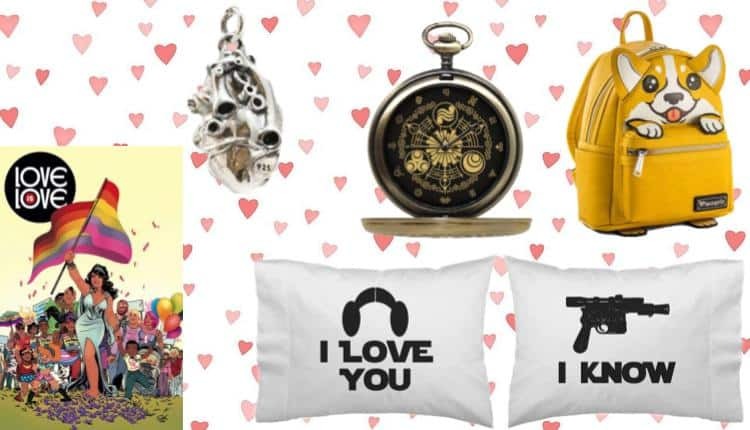 If you and your spouse are Potterheads, then look no further for the perfect gift! These riddikulously cute mugs from The Happy Life Club are sure to put a smile on any Harry Potter fan’s face. 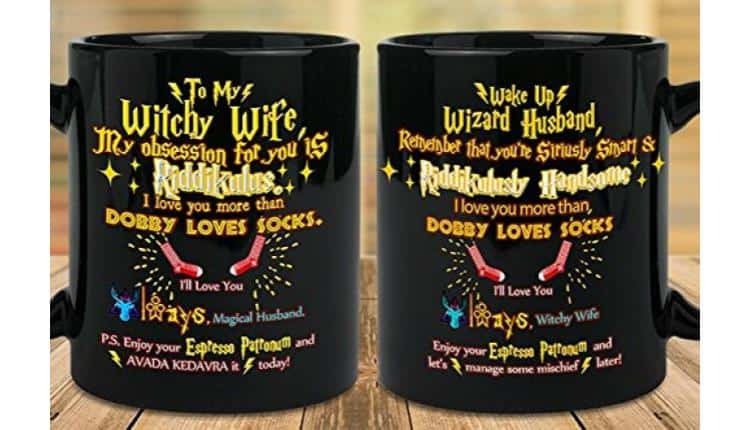 Fashioned for a husband and wife duo, this matching set feature a cute blurb that would even get Moaning Myrtle smiling.These stupefyingly sweet mugs are dishwasher and microwave safe, and hold an approximate 15oz. Perfect for that morning coffee or tea snuggled up to your sweetie. There is very little that gets a bibliophile going than the smell of a good book. Now, your favourite bookworm can have that smell on demand, even if they read with a digital device. This 14oz Bibliophile Scented Soy Candle is handmade in Tennessee by Highland Bluff Studio. 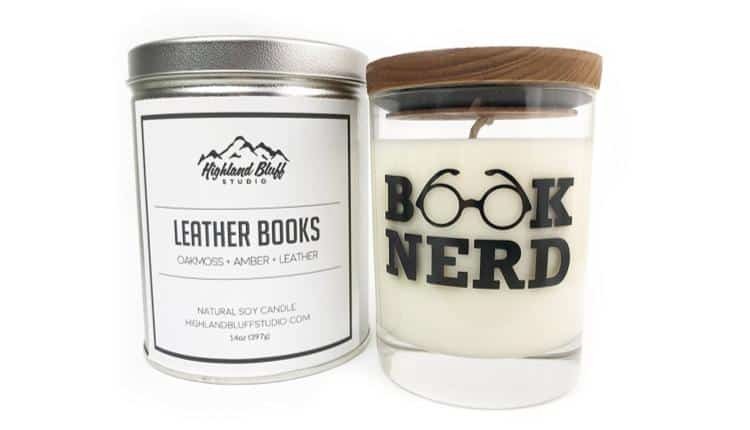 It uses a heady blend of amber, leather, and oakmoss to replicate the warm comforting smell of a good book, something any bibliophile can fall in love with. These re-sealable glass jar candles are made with all natural soy wax and cotton wicks, and will burn for an approximate 70-75 hours. That’s just enough time to get through a good chunk of your 2018 reading list! If you’re looking for a new pot to brew your superheated infusion of free-radicals and tannins, then look no further! 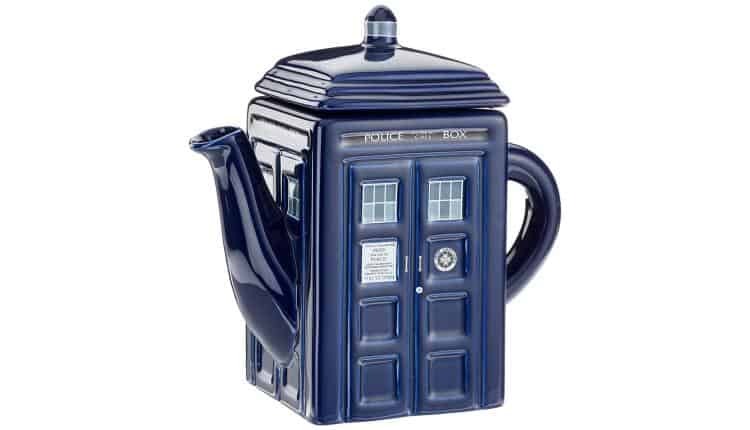 This Doctor Who TARDIS teapot has just the thing to heal your synapses and brew that perfect cup of tea. Capable of holding approximately 25oz of tea (barring any bigger-on-the-inside shenanigans) this ceramic teapot features an incredible amount of exterior detail. Classic TARDIS blue with a lid to keep everything warm. Please note: using this teapot with a TARDIS infuser may cause some wibbly-wobbly cracks in time that you may need your sonic screwdriver for. 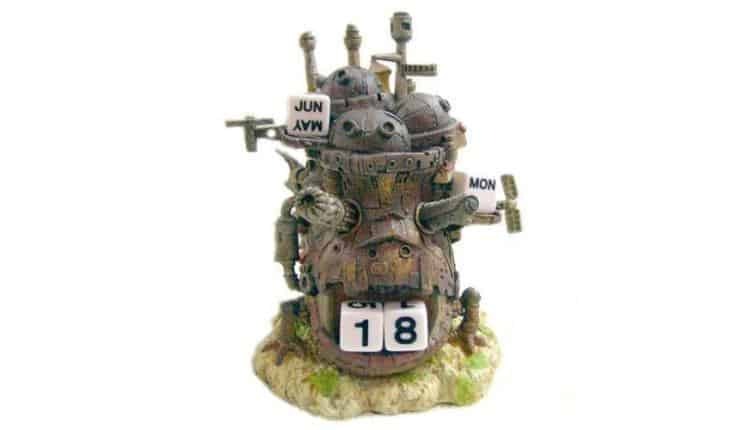 A calendar isn’t really what one would think about when considering a romantic gift, but fans of Studio Ghibli’s Howl’s Moving Castle will be overjoyed when given this desktop calendar. This exquisitely detailed calendar stands an approximate 6” tall and depicts the Castle from the movie (before the Witch of the Wastes steals Howl’s heart). Four different dice tell you the month, the day of the week, and the numerical date. This calendar can be used over the course of several years, which means that this gift will withstand the test of time. Much like your love! Puffins? What puffins? All we got are porgs. These little creatures have stolen the hearts of the Star Wars fandom, and all because the film crew couldn’t move thousands of puffins out of the shot. 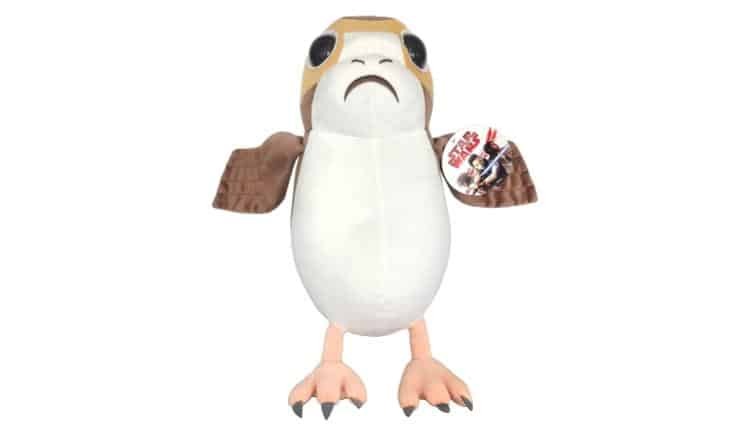 Now you too can have your own puffin costume porg in a much more cuddleable format. These 16” x 8” x 7” plushies are made from polyester, which makes them soft and cuddly, perfect for curling up on the couch for that Star Wars marathon you and your sweetheart keep wanting to do. Please note: Putting a Porg costume on an actual puffin without the benefit of CGI is considered animal cruelty. Please just get this plush instead. Check out even more Porg merchandise here. Be the talk of the Old Republic at your next party with this Stormtrooper decanter from Merchoid. 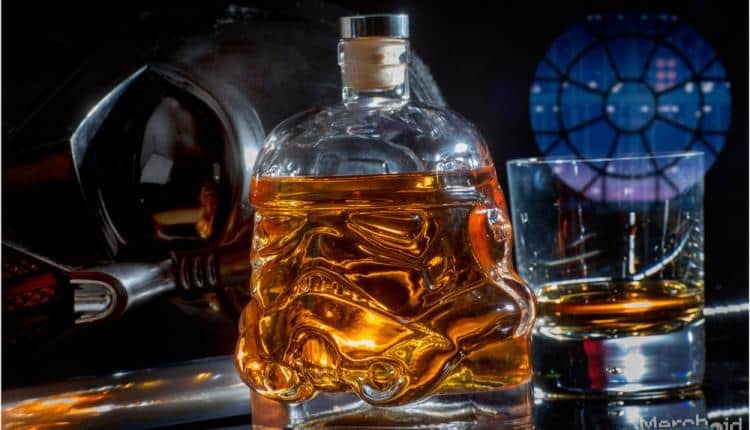 This decanter is based off of the original 1976 Stormtrooper helmet design, and used a mold similar to the one used for the actual props! If your sweetie is into Star Wars and making their friends jealous, then this gift is perfect! This cork-sealed super flint glass holds an approximate 25 fluid ounces of the good stuff, and when empty only weighs about 2lbs. It’s a great size to show off on your counter at 17” x 11” dimensions, though it is hand-wash only. Note: The decanter doesn’t come pre-filled. We asked.